What are the chances she'll email me back? I installed a nifty little gadget on my gmail client the other month, which reports different statistics about my emailing habits. It's pretty easy to install, as long as you don't mind giving this script permission to access your account. Every month, I get an automated email from myself describing the behavior of my sent and received emails. One graph which surprised me was the distribution of "conversation" lengths in my inbox. A conversation is defined as any new email and subsequent responses. (an email with the subject "Re: Re: Re: photos" is part of the conversation "photos".) So the more responses to an email, the larger the conversation is. Here's the distribution of conversations in my inbox for July. It's plotted on a log-log graph. and every point falls on a line, much like a power function. This suggests that there is simply a fixed probability with which someone responds to an email. In other words, the probability that I get a response to a message is independent of how long the conversation already is. Lets do some math... p(n) is the probability of having a conversation of length n. If we humans really reply with a time-independent fixed probability, then we expect the distribution p(n) to be equal to the probability of a single message being sent n times. I call this basal response probability p1. Taking the log on both sides, we can bring down the exponent and see how this distribution would be linear on a log-log plot. So what is the probability that I send/receive a single email? Lets solve for p1! Plugging in some numbers from the graph above, I find that p1 = 4.4%. Of course, we humans like to think that we make conscious decisions, and that we answer emails based on their relative importance. But the fact that my conversation distribution consistently falls on this line means one thing: either the vast majority of my responses are canned and trivial, or worse, I answer important emails at the expense of answering less important conversations less frequently than I would otherwise. I would be interested in seeing how this basal response probability (4.4%) compared to other people. Some other questions to pursue: do I preferentially end conversations, or do my pen pals? Does my p1 change from month to month? Is the variation away from a linear log-log behavior a good indicator for my productivity/procrastination for that month? Is this true for texts? I just got back from a wonderful trip around Europe with my fiancee. At one point, we made the trip down into the Paris catacombs, where the remains of 7 million humans are neatly stacked. "Stop -- It is here the empire of death", at the underground entrance to the ossuary. As we walked the mile-long bone-lined walls of the ossuary, I couldn't help but to feel injustice for those who thought their bodies would rest in peace (just 200 years ago!). The natural conclusion from this line of thought is that burial is not enough to guarantee peace. So what are the other options? When we emerged back into the streets of Paris, I was left with only one petrifying thought: I want to be a fossil. Technically, a fossil is any preserved specimen older than 10,000 years. Hence if I become a fossil, I achieve my goal of remaining undisturbed for quite a long time. So, how do I go about actually planning this? What instructions do I leave in a will? Find a place to die, preferably in sandstone which is growing, not eroding. Once you have found the ideal place, dig a deep grave, and request for your body to be buried inside without a coffin (unless you want the fossil to look like your coffin). Make sure you are lying flat, so as to minimize the distortion of your body as the earth around becomes distorted. Cover yourself in silicon dioxide before burial, and make sure your burial grounds has some rain, so that hard water will slowly seep into your body, depositing minerals into every cell, leaving you between a rock and a hard place. It's not immediately obvious to me why this has to take a long time. A pound of silicon dioxide is like 12 bucks on amazon. Okay! Proposed experiment: find an recently deceased leaf, cover it in mud, and slowly poor water saturated with silicon dioxide on it. If my espresso machine needs to be descaled of calcification every year, we should get a fossil leaf in no time! Seriously, I bought the silicon dioxide (it's a spice?). I'll post again with results soon. In reality, it sounds like my chances of ever achieving fossilhood are fairly slim. Of course, if I allow some bending of the rules, a fossil can also be any mark left by an organism, like a footprint. These are called trace fossils (as opposed to body fossils). A small stretching of this definition suggests I just need to make a strong enough impression on human-kind to affect change lasting 500 generations. Better get to work! 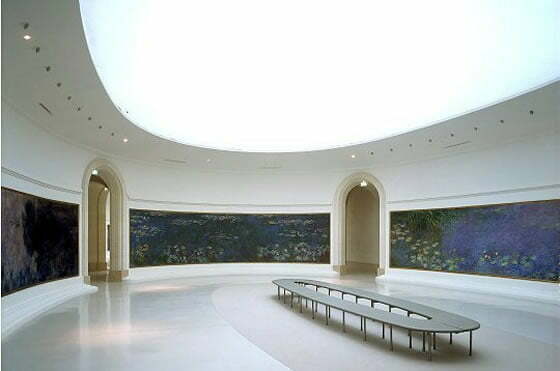 Today we had the opportunity to see Claude Monet's Water Lilies at Le Musée de l'Orangerie in Paris. They are paintings of Monet's garden stream; a scene of water lilies convolved with reflections of the trees and clouds. They were painted with the intention of hiding the horizon from the viewer, given her an impression of "an endless whole". This is complemented by the sheer size of the paintings: eight 13-meter wide paintings span the eight walls of two rooms. The rooms are shaped as the two connected ovals for the symbol for infinity. It is easy to get lost in these brush strokes. Monet started painting from his home in his later years, and produced around 250 of lily paintings. 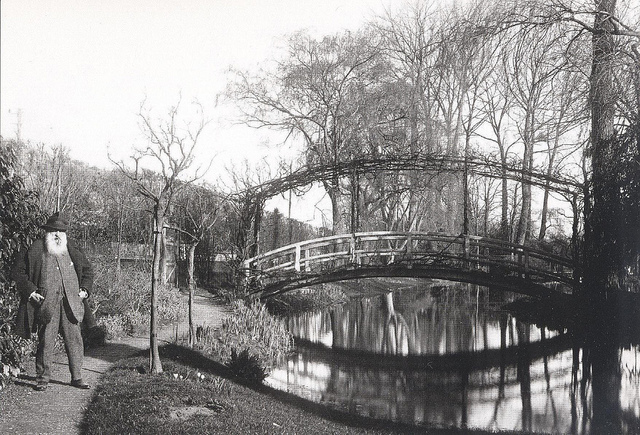 Amazingly, it's still possible to visit Monet's gardens today, about an hour out from Paris. Searching around the gift shop of the exhibition today, I noticed a postcard of Monet posing with the motivation of his lily paintings. It seemed peculiar to me that in this particular photo, no lilies exist, and the trees are shorn of leaves. The wintry condition of his garden is never a subject in his paintings. Why not? He spent nearly thirty years painting lilies, yet this scene does not occur in his paintings, to my knowledge. I bought the postcard, because at the time it struck me that Monet was the vehicle for transcribing the scene behind him onto the canvas. Through his eyes, it was always spring. Or maybe, less romantically, he chose to stick with lilies because they provided the necessary conflict with the depth of the reflection to bring life to his paintings. It would be a fun project to imitate the style of Monet's lilies, but for a winter scene. A fun parody, with dead ducks and bare branches. The painting at the top, titled "Les Nuages" or "The clouds" was my favorite, for it best captured a large reflected scene without showing us what is being reflected, forcing us to make educated guesses. Somewhere else in the museum, I saw a photo of the same painting in black and white, and thought it was as striking in dynamic range and suggestion as the original. Instacart lost my trust with their secret 30% price markup. How could I not be smitten with Instacart when their customer support contact email is happycustomers@instacart.com? After my first order with free shipping, I was exciting at the prospect of saving an hour a week using Instacart (that adds up to five 12-hour days a year!). But something just didn't add up. How was Instacart making money? The overhead for Instacart, disregarding website costs, is simply paying the "personal shoppers" to go to Trader Joe's to get my European Thick and Creamy yogurt, and deliver it to my door. If these shoppers are paid minimum wage ($10/hr in CA), then they must complete three trips an hour to break even. The shoppers must do parallel runs to the grocery store, so let's say they average 10 shopping trips + delivery every hour. That's $30 in delivery fees minus $10 to pay for the personal shopper's salary. So $20/hour profit for every 10 Instacart users, or about $2 per person -- less than a latte. And this isn't even accounting for costs of website infrastructure, paying back Yc investors, etc. So there's only one other way that Instacart is monetizing: they systematically raise their prices relative to the in-store price. Is this true, Instacart FAQ? Are your prices different from the store? Yes, Instacart prices are our own and vary from the store’s price. Our prices can be lower, the same, or higher than the store price. If you notice an item that you believe is priced incorrectly or unfairly, please email us at happycustomers@instacart.com. Well, it certainly doesn't sound like they raise the price systematically. Maybe Instacart has some kind of business arrangement with the grocery stores, with some monetary incentive for sending customers along? I emailed customer support to find out. This was my first order, and I'm happy with how it went. I do have some question about how your company works... From navigating your site, it's not transparent how your business operates. Do your personal shopper employees simply go to the store on my behalf? Is there a formal relationship between TJ's, Whole Food or Safeway and Instacart? Thank you so much for your order! I am super glad to know that your experience with us has been a good one. Instacart does not have any type of relationship with any of the stores. 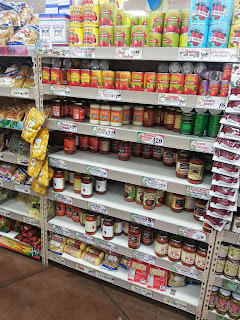 We receive your order and our shopper is alerted of the order and does personally go to the store and shops for your groceries. Please let me know if you have any other questions. So prompt and so nice! They must be a good company. But from a user's standpoint, this response is plain fishy. I'm not a lawyer, and I'm uncomfortable with the idea of buying food from a third party. I asked a TJ cashier if they ever saw the Instacart personal shoppers. I imagine them coming to the cash register with three of every staple, like milk, eggs and almond cocoa spread. Screw you, Instacart. We're over. Not because you raised your prices, but for being so damn sneaky about it, and for not trusting your customers enough to let them know how you make money. Why don't you just disclose that all prices are 30% higher on your website? 30% is a big deal. That's four times the state sales tax. I feel betrayed, and I'm making sure my friends in Oakland know. 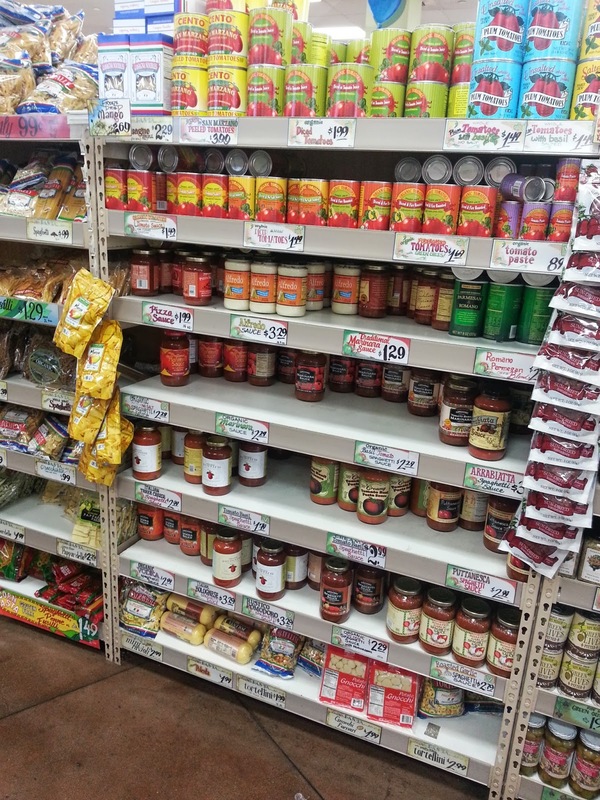 Of course, Trader Joe's is also run by an ultra-secretive German company. Let be honest: the real reason I can't rely on Instacart is because they don't deliver booze. Insta-deal breaker. Interesting piece on becoming Who You Want To Be came out this week, from every blog ever. The blog title template "Three steps to X" is a tired snowclone. ...the brain is a malleable organ. Every time you do an activity, or have a thought, you are changing a piece of yourself into something slightly different than it was before. Every hour you spend with others, you become more like the people around you. Gradually, you become a different person. If there is a large gap between your daily conduct and your core commitment, you will become more like your daily activities and less attached to your original commitment. Brooks touches upon a more intimate version of the mind-body problem in philosophy that cognitive science has made us aware of in the last half century: there is an inextricable link between psychology and philosophy that needs to be addressed head on. When we acknowledge the feedback between the real world we experience and our mind, then we can use this fact as a more effective means towards our goals. If the brain is fallible (and it is), then lets hack it. To become the ubermensch, we must embody the ubermensch, at least temporarily. Or in other words, to change ourselves in a specific way -- say, exercising more, or writing a little every day -- then we must start by enacting those changes, even if we dislike them in practice. In doing so, we reinforce those neural motifs in our brain, which hopefully feeds back into our desire to continue enacting those changes we sought. Okay, seriously, I don't know what I'm talking about. I just found out on Wikipedia that there's such a thing as neurophilosophy. But I've been tinkering with this thought for a while, and I realize it's been around for a long time. The best example I can think of is method acting. The basic principle of method acting is to try and recreate the emotions and thoughts of your character in yourself, in contrast to simply trying to act out the emotions and thoughts of your character. We are creatures of habit. Step one in achieving our personal best is taking that first step. The second will be easier. Maybe it's easier said than done, but saying it wont do anything.